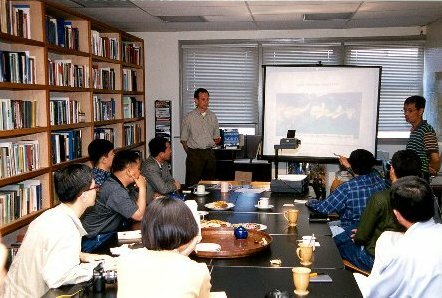 BERKELEY, CA, JUNE 4, 1999 -- On Wednesday, June 2, a 10-member South Korean environmental delegation visited the Nautilus Institute for a briefing on the Institute's work on environmental issues. The ROK delegation was made up of city council members, government officials, and representatives of citizen watchdog groups from the city of Kwangju in South Cholla Province. It was led by Reverend Dae-Soo Lee, director of the Korean Network for Waste Free. The group is on a tour of the Western United States to learn about alternatives for addressing waste disposal and other environmental problems, to help in opposing a proposal to build an incinerator and landfill on the outskirts of Kwangju. Delegation of local officials from the Republic of Korea visits the Nautilus Institute in Berkeley, CA for a briefing on sustainable cities issues. Here, Ken Wilkening discusses long-range transport of air pollutants. For help in their research efforts, the visitors were provided a number of information resources on dioxin and other pollutants, including the Web sites of the Toxic Substances and Disease Registry at the Centers for Disease Control and Prevention and the Silicon Valley Toxics Coalition. Nautilus experts also briefed the visitors about environmental sustainability issues applicable to cities. Ken Wilkening, Program Officer for Energy, Security, and Environment in Northeast Asia, gave a presentation on trans-boundary air pollution, explaining how new scientific studies are showing that pollution generated in Asia is reaching the west coast of North America. Lyuba Zarsky, Nautilus Co-Executive Director, introduced the Institute's global governance and corporate accountability projects, which are aimed at getting multinational corporations to adhere to environmental and human rights standards. Finally, Co-Executive Director Peter Hayes gave a slide-show presentation on the DPRK Renewable Energy Project, including the wind turbines installed last year at Unhari Village in North Korea. Nautilus presented guests with copies of the recent Bulletin of the Atomic Scientists, with the cover story featuring the Institute's wind-power project in North Korea. The visiting delegation presented Nautilus with a beautiful ceramic tile by reknowned Korean artist Lee Chul Soo.